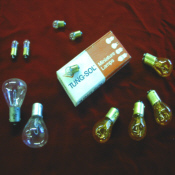 Hard to find obsolete Interior and Exterior Lamp Bulbs! As most cars use 4 or more of the same bulb, you will have some handy spares. Helpful note: Just remove a bulb from its socket and look for the # on the brass base. On bulbs with no brass base, the # will be on the bulb. You can also find a chart in your owners manual for application and bulb #. Sorry, we do not have these charts or lists of applications. Our standard and halogen headlamp sealed-beam bulbs are a direct replacement, ready to install. No kits or modifications are needed to install any of our old car headlamp bulbs.